Canon today announced new additions to its PIXMA range of inkjet printers and multifunctions. The product updates are primarily focussed on home users, with minor hardware improvements as well as better software. For home users, Canon has released the PIXMA iP4700 inkjet printer, as well as the MP640 and MP990 inkjet multifunctions. The Canon PIXMA iP4700 inkjet printer offers automatic duplex printing, CD/DVD printing and print speeds of up to 9.2 pages per minute for monochrome documents and 8.1ppm for colour ones. The PIXMA MP640 and MP990 inkjet multifunctions both offer Wi-Fi connectivity, CD/DVD printing and Canon's proprietary Easy Scroll Wheel. The multifunctions allow users to print directly from USB flash drives through the front-mounted PictBridge port. Like its predecessor, the PIXMA MP980, the PIXMA MP990 offers Ethernet connectivity and 35mm slide and negative scanning. The company also announced the PIXMA iX7000, an A3+ inkjet printer which provides three-way media feeding and print speeds of up to 10.2 pages per minute (ppm) for monochrome documents and 8.1ppm for colour ones. The inkjet printer uses Canon's LUCIA pigment inks and incorporates PgR technology to prevent ink bleeding and water damage. Pricing is yet to be announced for the four printers. The PIXMA iX7000 is scheduled for release in September, while the other PIXMA inkjets will be released in October. Canon PIXMA brand manager Beryl Thomas told PC World Australia that the biggest improvements offered in the new range were software-based, including new versions of the bundled Easy-Photo Print and Easy-WebPrint applications which help users print photos and Web pages. The latest version of Easy-Photo Print includes Canon's Auto Photo Fix II technology, which provides improved red-eye correction. Exposure correction has also been improved, allowing users to automatically adjust a photo's lighting in more than one zone. Easy-WebPrint EX will allow users to collate information from various Web sources into an easily printable document. 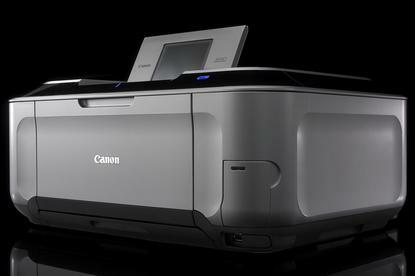 Canon also announced two new LASER SHOT colour laser printers, the LBP7200Cdn and LBP7750Cdn. Both printers offer a new all-in-one cartridge which combines the drum, waste unit and fuser in a single package for easy replacement. The LBP7200Cdn, priced at $599, will print both colour and monochrome documents at 20 pages per minute, and has a 250-sheet paper feeder. The $2499 LBP7750Cdn colour laser printer is able to print at 30ppm and supports a variety of print languages including PCL5c, PCL6 and UFRII. Canon says the LBP7750Cdn consumes 1.7 Watts of power in sleep mode. Both laser printers will be released in September.